I’ve been working with a guy in my area on some new products. He has fantastic attention to detail and have really knocked these acoustic cylinders out of the park. More to come later. More. Please. Interested in the drivers, and dispersal pattern. No drivers. Passive room treatments. LOL. Fooled me, but that’s easy. That’s quite a room treatment. I’ve been using the cylinders for a while now but these are built to a completely different level with some additional functions. I prefer these over wall treatments as the flexibility is off the charts. A few inches here or there can drastically change the sound. Please direct me, if you can, to a page with more info… Thanks Skip! i had a chance to listen to these tonight and i am very intrigued!! 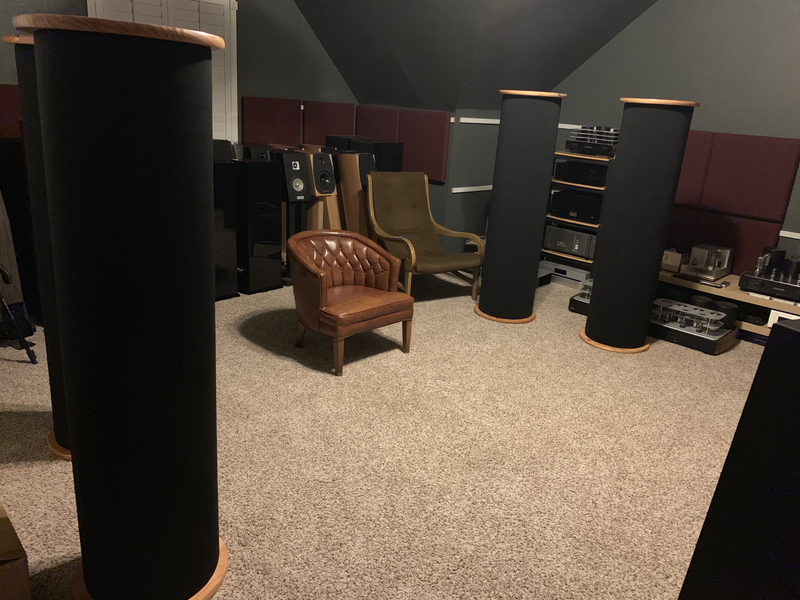 when you first look at them you think bass traps but they are much more. 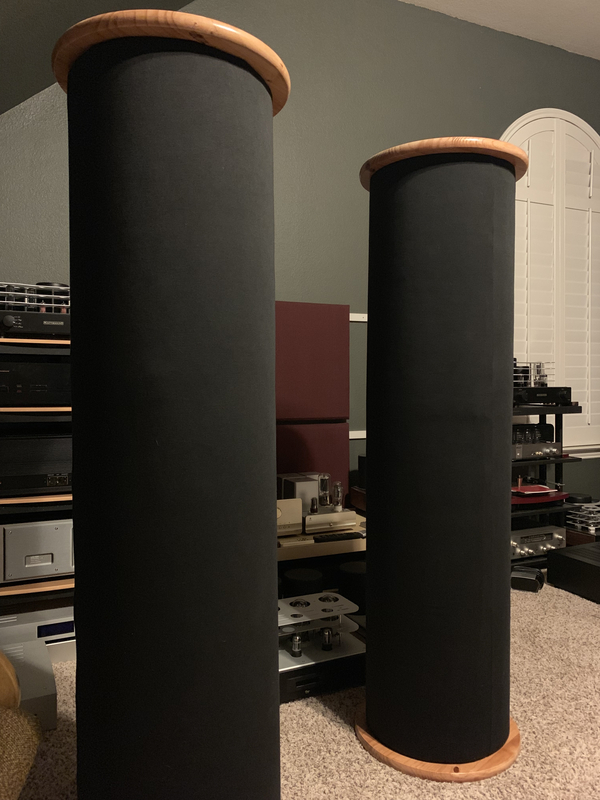 half of the cylinder is for sound diffusion and the other half is for sound absorption so you can place them anywhere in the room and rotate them in or out to tune the sound of your room. i heard them tune sound stage width and depth, mid range clarity and the highlighting of different portions of the sound spectrum. you can start with two and increase to as many as you need. can't wait to get a pair in my room and run them through their paces. they can be made to your heart's desire. Also had the pleasure of hearing these earlier tonight. Really cool product with a ton of flexibility. Combining absorption and diffusion options into one unit is really smart and ahead of the curve. To me the other big feature is these don't need to be installed. Take them out for listening sessions, and then toss them into a closet or out of the way when you're done. Excited for more people to get to hear these. Some small movements in key placements make striking differences. To me the other big feature is these don't need to be installed. Take them out for listening sessions, and then toss them into a closet or out of the way when you're done. Which is really cool but after heavy drinking with you're buddies they will get wrecked and then your spouse will move them strategically so that you trip over them in the middle of the night after you've p'd her off. Just saying... Other than that, great idea! Is the diffuser tuned to a particular frequency? At what range is the absorption? I don't know what frequencies the ones we were listening to were set for, but there was discussions of multiple sizes potentially being offered in the future as well. So I'd imagine if you have specific needs/interest they could have a discussion on what size and tuning would work best. No way the diffusor goes down to 40hz. I think you mean the absorptive properties. it is the absorptive half of the column. i was answering that part of the question. My opinion on these type of things have previously stated, but, I'm going to say it again...there are pretty strict rules of physics and acoustics in play here, and true you can definately hear a noticable difference when something like this is introduced in to a room, the question is is it accurate? Each diffuser needs to be designed for the frequency you need to control. Not just an arbitrary collection of diffuse materials. Same goes for absorption. Only certain materials will control the lower registers. Most materials used for absorption do not control the lower registers.